Join us in the spectacular city of San Francisco for the 113th AUA Annual Meeting! Don’t miss the American Urological Association’s 2018 Annual Meeting, May 18-21 at the Moscone Center in San Francisco! Last year's meeting welcomed more than 16,000 attendees from more than 100 countries around the world, underscoring the meeting's value to the global urologic community. This year's meeting will feature more innovative programming and educational offerings than ever before, giving you unparalleled access to groundbreaking research, the latest clinical guidelines and the most advanced technologies in urology! Explore this year’s extraordinary program! Use the tools in the left navigation to explore our program. Sort by topic, speaker, program type, day and more! More than 50 hours of Plenary programming featuring the very latest updates from today’s leaders in urologic medicine. 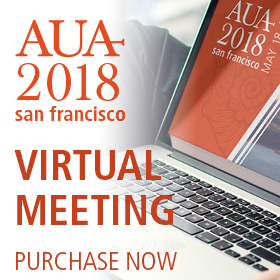 Not-to-be-missed programs like Crossfire: Controversies in Urology; Second Opinion Cases; Surgical Techniques: Tips and Tricks; Court is in Session; and more! 80 Instructional Courses—spanning the spectrum of urology—PLUS an array of Hands-on Courses that allow you to expand your skills under the guidance of experts. Innovative new programs like Survivor Debate where debaters use their knowledge and persuasion to avoid getting voted off the island! More than 2,500 scientific abstracts from all corners of the globe, presented as poster, podium and video sessions. Opportunities to expand your education, network with colleagues and explore the latest technologies in urologic medicine in the Science & Technology Hall.